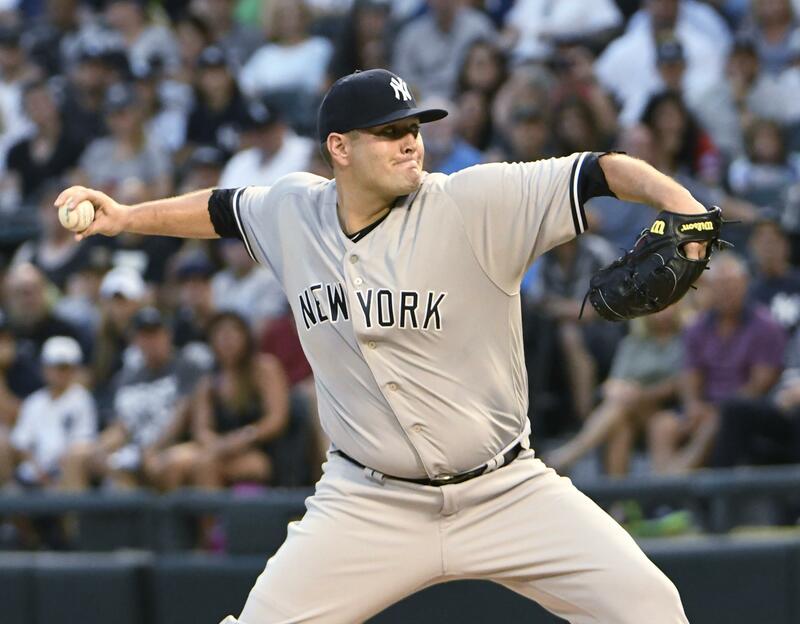 Mon., Aug. 6, 2018, 10:54 p.m.
Lance Lynn pitched two-hit ball into the eighth inning in his first start with New York, and the Yankees rebounded from their tough weekend in Boston by beating the Chicago White Sox 7-0 on Monday night in Chicago. After Tim Anderson flied out, A.J. Cole finished the three-hitter for the A.L. wild-card leaders. Indians 10, Twins 0: In Cleveland, Trevor Bauer struck out 11 and allowed three hits in six innings, and Cleveland hit four home runs in routing Minnesota. Bauer (11-6) has 206 strikeouts this season, one behind Boston’s Chris Sale for the A.L. lead. The right-hander has 10 double-figure strikeout games, tying him with Sale for the league lead. Bauer also leads the A.L. with 159 2/3 innings pitched. Edwin Encarnacion drove in four runs, including a three-run homer in the seventh. Yonder Alonso, Brandon Guyer and Jason Kipnis also homered for Cleveland, which leads Minnesota by 10 games in the A.L. Central. Adam Cimber, Oliver Perez and Dan Otero each pitched an inning to close Cleveland’s A.L.-leading 12th shutout. Rockies 2, Pirates 0: In Denver, Kyle Freeland and the Colorado bullpen combined on a two-hitter to help the Rockies beat Pittsburgh in a game that was interrupted 32 minutes by rain. It was a positive step for a beleaguered bullpen that endured three walk-off losses – two by Davis – during a 2-5 road swing. Cubs 3, Royals 1: In Kansas City, Missouri, Javier Baez went deep, Cole Hamels pitched six strong innings and the Cubs beat the Royals. Baez doubled in the eighth to score Jason Heyward, upping his RBI total to an N.L.-leading 88. Mets 6, Reds 4: In New York, rookie Jeff McNeil homered in getting three more hits with his knobless bat, leading Noah Syndergaard and the Mets over the Reds in a matchup of struggling teams. Marlins 2, Cardinals 1: In Miami, Javy Guerra cleaned up a ninth-inning mess created by struggling closer Kyle Barraclough, getting Yadier Molina to hit into a double play to end the Marlins’ victory over the Cardinals. Mariners 4, Rangers 3 (12): In Arlington, Texas, Ryon Healy had a go-ahead RBI single with two outs in the 12th inning and the Mariners beat the Rangers after blowing an early three-run lead. Astros 3, Giants 1: In San Francisco, Roberto Osuna got the win in his first appearance with Houston after Marwin Gonzalez hit a three-run homer with two outs in the ninth inning, lifting the Astros over the Giants. Angels 6, Tigers 2: In Anaheim, California, Andrelton Simmons hit a two-run homer and made several spectacular defensive plays to lead the Angels to a victory over Detroit. Simmons stepped up with two key hits and two runs while Mike Trout missed his fifth consecutive game with a sore right wrist for the Angels. The two-time A.L. MVP’s injury absence is the second-longest of his big-league career, surpassed only by the 39 games he missed last season with a torn thumb ligament. Published: Aug. 6, 2018, 10:54 p.m.